The new iOS 5 will no doubt be announced by Apple’s new CEO Tim Cook in October, it is expected that October 4 will be the day WWDC event kicks off and we are excited. But we have found out that the Target iOS app has leaked the speech to text feature, which is expected to release within the new iOS 5. It is fact that Apple is getting ready its new voice-to-text, speech-to-text, call it what you may, but no one has seen it in full working order as of yet. This is where the new Target application comes into play, and thanks to TheNextWeb they have some great information. 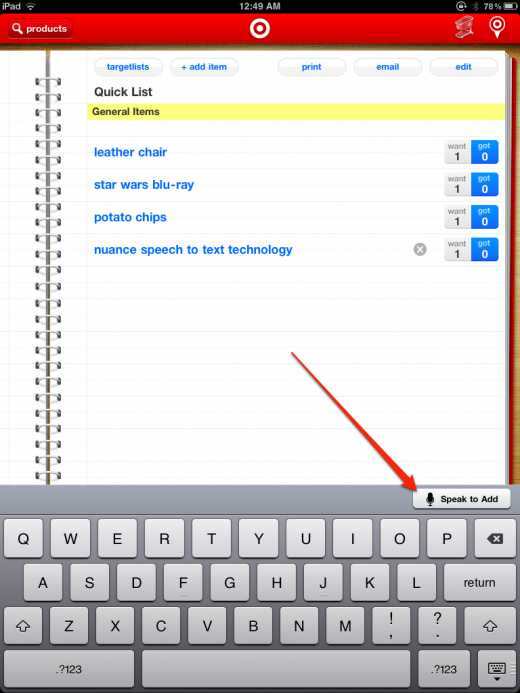 They report thanks to a Daring Fireball reader that the new Target app shows off the speech-to-text button near the keyboard, titled “Speak to add” and it is Nuance that provides the speech dictation. Nuance is the marvels that are working on the top secret Voice-to-text (speech-to-text) and this is going to be what is in the new iOS 5 once it releases to the public. It has not even been tested in the beta stages. The new speech-to-text will give users a microphone button on your iPhone’s keyboard, just simply tap this and the words users have spoke will translate to text, basically in a nutshell speaking a text message with ease. Nuance have had their name stamped on many iOS apps, no one is sure if Nuance and Apple have a relationship so we will have to sit back until the hopeful WWDC event kicking off October 4 with Tim Cook being the front man. Wow, I’ve had that for the last year on my Galaxy S. What an innovator.